Oil on canvas, 95 x 77 cm. Christian August Lorentzen (1749-1828) became professor at the Royal Danish Academy of Fine Arts in Copenhagen in 1803, succeeding Jens Juel. This was the same year Lorentzen’s later student Martinus Rørbye (1803-1848) was born. Rørbye began studying at the Academy of Fine Arts in 1819 and in 1827 painted the portrait of the old professor, who died the following year. The painting was exhibited at Charlottenborg in 1828 and received much praise from one of period’s arbiters of taste, art historian N. L. Høyen, who could otherwise be very scathing in his criticism. Høyen wrote of the portrait: “the old, friendly man sits, quite content, in front of his easel, surrounded by artworks. It appears as if something has suddenly distracted him from his work and as if he is not so much looking at a particular object as absorbed in reflections on things he has seen; and in so doing he has found rest from his labour, and this calm which has fallen over his entire body, while an inner life glistens in his eye, is captured magnificently. One does not tire of looking at this piece”. Høyen is right; one does not tire of looking at this portrait. 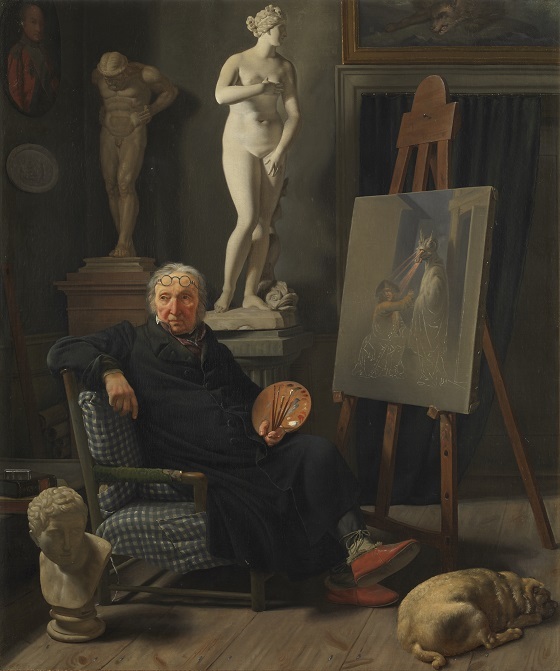 The professor is depicted in his studio at Charlottenborg, and it is a very empathetic portrait. The old artist sits as if in a reverie, with his glasses perched on his forehead, lost in thought. What is he thinking? Is he tired? At the time the portrait was painted, Lorentzen was approaching 80. Perhaps he and the dog are longing for eternal rest? With Lorentzen’s death, the Danish art world lost one of the representatives of the old Academy of Fine Arts, and his younger colleague C. W. Eckersberg, who also taught Rørbye, ushered in a new era in Danish art. Rørbye was born into a Danish official family in Norway, but moved with his family to Denmark as a child. He studied at the Art Academy under C.W. Eckersberg, from whom he inherited and continued the objective and realistic approach to subject matter. Rørbye loved travel and travelled more than any of the other Golden Age painters. His travels brought him to Norway, France, Italy, Greece and Turkey, where he carried out numerous ink and oil sketches in front of the subjects for later use in paintings. In 1844, Rørbye became a professor at the Academy, but died four years later of disease.